Arrival at the Wattay Airport from Bangkok by flight TG570 ETA 12.55. Welcome to Vientiane - the Capital of Laos - the only land - locked country in Southeast Asia 'land of a million elephants' and one of the last places to see old Indochina. 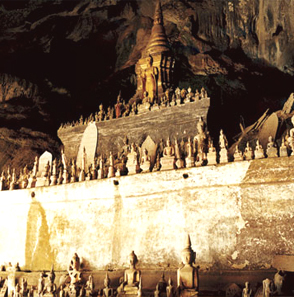 Laos' isolation from foreign influence offers travellers an unparalleled glimpse of traditional southeast Asian life. From the fertile lowlands of the Mekong River valley to the rugged Annamite highlands, Laos is the highlight of southeast Asia. Sits on a bend in the Mekong River amid fertile alluvial plains. 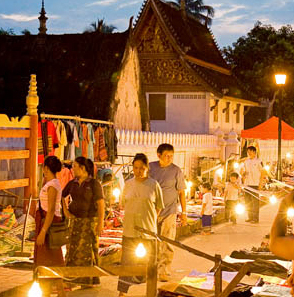 Despite its chequered past, Vientiane is a laid-back city with a number of interesting Wats and lively markets. Upon arrival transfer to local restaurant for lunch and rest time. After lunch, you have a glimpse of 'Vientiane' including the oldest temples such as : visit to Wat Sisaket, built in 1818 by Chao Anou - the very king responsible for incurring the wrath of the Siamese and causing his capital's obliteration. The interior of the main hall, and the walls of the surrounding courtyard, are inset with thousands of tiny niches and shelves containing 6840 Buddha images and Buddhist inscriptions from the 18th century. Then Patouxai war memorial. 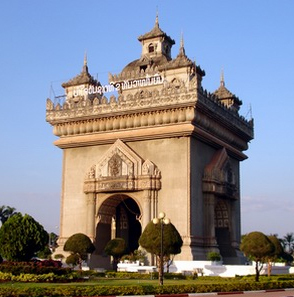 Inspired by the Arc de Triomphe in 'Paris', the Patouxai (Lao for Gateway of Victory) is adorned with an array of rough hero Lao historical imagery and offers a splendid, panoramic view of the city from its top. Transfer to hotel for check in and free at leisure for your own activities. Evening, you will enjoy dinner at local restaurant with Lao Traditional dance. Today, after breakfast, drive to visit 'Buddha Park' - is a religious sculpture park Located by the Mekong River 24 km down Stream from 'Vientiane'. Where you can see the view of Nongkhai as well. Buddha park or Garden of Statues (1958) comprises a collection of Buddhist and Hindu sculpture in a level field of grass. Then take a brief visit Vientiane with Wat Ho Phakeo - a former royal temple, built in 1565 by King Setthathirat, the temple was originally designed to house the famous Emerald Buddha, which he had brought with him from the Kingdom of Lanna, That Luang - The most important national monument in Vientiane, is a symbol of both Buddhism and Lao sovereignty, was constructed in 1566 by King Setthathirat. After that, transfer to airport for flight to Luang Prabang by QV103 at 16.30-17.10. Luang Prabang – the ancient capital of the Lao Kingdom, list by UNESCO as World Heritage Sites in 1995. Welcome and transfer to hotel. Luang Prabang today is a small, peaceful town with a remarkably well-preserved combination of Lao and colonial French architecture, which led to UNESCO World Heritage in 1995. Though virtually nothing of the magnificent 14th century capital of Fa Ngoum has survived the ravages of time and numerous invasions, the city is still a veritable treasure trove of beautiful temples, and historical monuments of the kingdoms that rose and fell in the centuries that followed. Transfer to hotel for check-in. On early evening, we explore Street Night Bazaar, where you can find the lovely collection and handmade textile by local and hill tribe people surrounding Luang Prabang. Back to your hotel and free at leisure for your own hobbies. After that, you will enjoy the Kuangsi waterfall, a beautiful spot 32 km south of town with a wide, many-tiered waterfall. Go on a trail ascends through the forest along the left side of the fall to a second tier, a large pool will appears in your eyes (swimming is available), tourists will stop here for a while, explore the fell and surroundings with lot of interests. Finally, you climb up to the top of the Phousi temple with 382 steps up to take a good view of the beautiful sunset, of greater Luang Prabang and Mekong rivers on surrounding. Then, transfer to airport for flight back to Vientiane by QV110 at 19.10-19.50. Private-transportation between areas by A/C vehicle, boat indicated in the itinerary. Accommodation based on twin sharing room with daily breakfast. Sightseeing and entrance fees as indicated in the itinerary on travelling days. Meals (3 lunches + 3 dinners) at local restaurants as indicated in the itinerary on travelling days. Regional English speaking guide on travelling days. International / Domestic flights and departure airport taxes. Personal expense such as telephone calls, fax, laundry, beverages and meals, and highlights or sightseeing’s which are not indicated in the program. Tips to guides, porter ages & drivers. Child under 6 YRS without extra bed: 40% of adult’s rate, with extra bed: 65% of adult’s rate. Child from 6-10 YRS without extra bed: 60% of adult’s rate, with extra bed: 80% of adult’s rate. Other similar hotels are replaced if the mentioned hotels are fully booked.